Volkswagen’s latest efficiency technology, “cylinder shut-off” will debut in the new 1.4 TSI engine. This is another large step for Volkswagen in terms of saving fuel in its models. 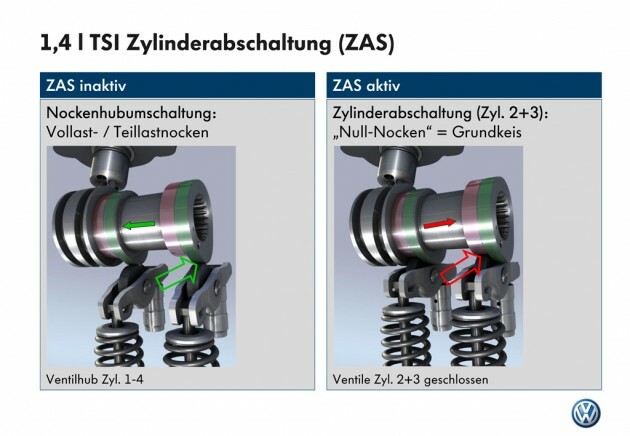 Volkswagen will be introducing cylinder shut-off on Volkswagen production cars in early 2012. Volkswagen is currently the first carmaker to implement cylinder shut-off in a mass produced 4-cylinder TSI engine. The primary goal of the high-tech system is to significantly reduce fuel consumption by temporarily shutting off two of the four cylinders during low to mid loads. In fact, cylinder shut-off reduces fuel consumption of the 1.4 TSI by 0.4 litre per 100 km in the NEDC driving cycle. When the Stop/Start functionality is integrated, which deactivates the engine in neutral gear, the savings effect adds up to about 0.6 litre per 100 km. The greatest benefits of the cutting edge technology are realised while driving at constant moderate speeds. 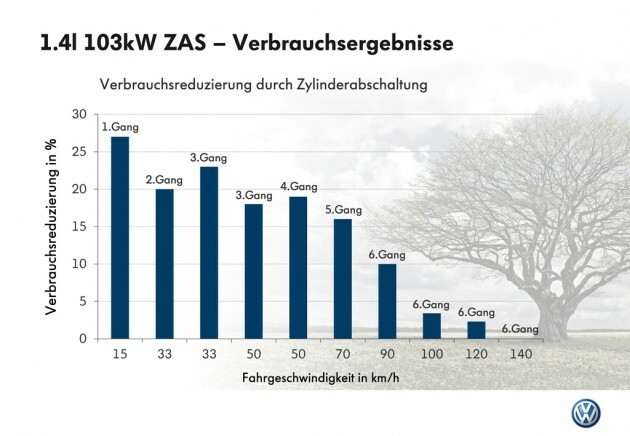 At 50 km/h, in third or fourth gear, savings amount to nearly one litre per 100 km. This new fuel efficient TSI will therefore also fulfil the future EU6 emissions standard effortlessly. High efficiency does not exclude driving comfort: even when running on just two cylinders, the 1.4 TSI – with its excellent engine balance – is still very quiet and low in vibration. The TSI engine is actually essential in implementing cylinder shut-off technology in its current form. That is because it eliminates complications in gas exchange that would otherwise occur in multi-point injection engines. Cylinder shut-off is active whenever the engine speed of the 1.4 TSI is between 1,400 and 4,000 rpm and its torque is between 25 and 75 Nm. This applies to nearly 70 per cent of the driving distance in the EU fuel economy driving cycle. As soon as the driver presses the accelerator pedal sufficiently hard, cylinders 2 and 3 are reactivated unnoticed. Volkswagen utilises information from the gas pedal sensor to detect the driver’s mode of driving. If the driving exhibits a nonuniform pattern – e.g. while driving in roundabout traffic or in a sporty style on a country road – shut-off functionality is suppressed.